Battle Type Evolution Requirements Mamemon + Winning Percentage: 60%! Metal Mamemon + Winning Percentage: 60%! Big Mamemon + Winning Percentage: 60%! 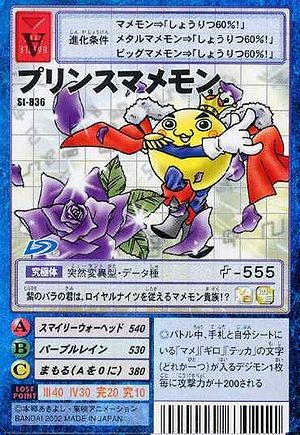 A monarch of purple roses, this Mamemon aristocrat counts the Royal Knights as its subordinates!? ◎During battle, for every Digimon card with 'Mame', 'Giro' or 'Tekka' in its name in your hand or on your sheet, add 200 to your attack power. This page was last modified on 2 August 2016, at 00:34.